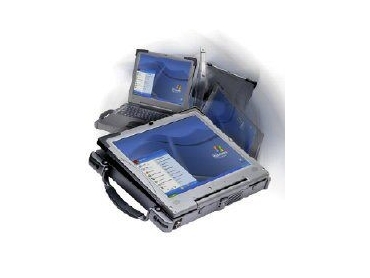 KONTRON’S rugged notebook or convertible-tablet PC now comes with Pentium M 1.7GHz and sunlight readable LCD screen. Kontron is represented by Dedicated Systems . The ReVolution is a fully Windows-capable computer that converts in seconds from a notebook to tablet with a quick flip of the rugged, 180° display hinge. Built to take punishment that would cripple an ordinary notebook or tablet, the ReVolution is tailored for field-deployed professional working in challenging conditions. The notebook can be custom-tailored to best meet specific applications. It features impressive communications capabilities, including embedded Bluetooth technology, optional integrated CDPD, CDMA, or GSM for wireless WAN connectivity. Its full magnesium construction design is tested to US military and NEMA standards for resistance to shock, vibration, water, temperature and dust.